1. This SLYPNOS Children Desk & Chair Set combines fun and safety for kids of varying age and size! 2. It features adjustable height that keep up with your fast growing child, keep them motivated for studying and learning and enjoy more fun. 3. It comes with non-slip feet adding stability and protect floors from being scratched. 4. This desk and chair set is SGS and CPSIA certified, safe for your kids to use and perfect for your kids' rooms, study areas, classroom, study, living room and bedroom. 1. All dimensions are measured manually with a possible deviation of 0.4-0.8 in. 2. 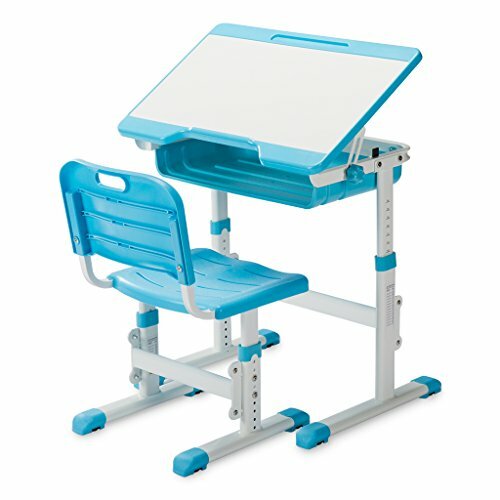 The desktop can be used for the drawing board with watercolor pen, must be wiped after use. 3. Please check and fix the screws regularly (at least Once a month) to avoid wobbles. 4. wipe with a damp cloth if dirty. 5. Desk and chair should be installed and used under the guidance of adults. Ergonomic Design: Best choice for Children's gift, recommended for ageds 3-14, comfortable sitting and proper body positioning which is important in maintaining good health, slightly contoured areas on the chair follow the natural curves of thighs improving blood circulation. If you have any questions about this product by Slypnos, contact us by completing and submitting the form below. If you are looking for a specif part number, please include it with your message.